Skoulli is a small traditional village just 7 km from the resort town of Polis and the crystal clear waters of Chrysouchou Bay. Lying in on the hillside and overlooking the "Golden" green valley of citrus and olive groves it gives the opportunity to the visitor to enjoy Skoulli village is known for its friendly locals and many fruit orchards. There are two supermarkets, tavernas, coffee shop and a large electrical store in close proximity. 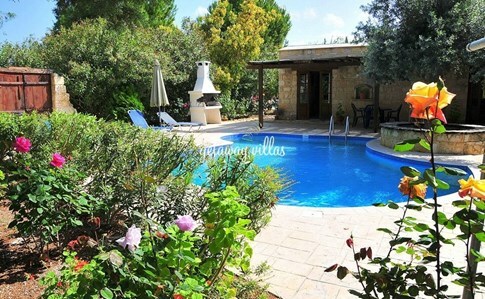 Polis and Latchi with their and numerous beaches, cafes and restaurants are only a 10 minute drive away while Paphos town centre approximately 25 minutes drive away. 5% off for bookings made more than 0 days ahead. Click on the villa picture for more info.